Artist's impression of sunrise over CoRoT-7b, a planet 70% larger than Earth. At the time of its discovery in 2010, it was the smallest known exoplanet. Today, rocky exoplanet finds are common in planetary searchers. When a distant planet appears as a point of light in a telescope, it's hard to imagine what things are like at the surface. Does rain fall? Is the atmosphere thick, or dissipating into space? How constant is the sunlight on its surface? Telescopes today are only just beginning to answer that question and get us closer to understanding where extraterrestrial life might exist. As planets transit across the face of their stars, it's possible for astronomers to figure out what chemicals are contained in the planet atmospheres, and to make predictions. However, until now only hot giant planets are observable. "It's very ambitious," Forget said. "It’s designed in a way so we can simulate, as much as we can, a planet with any kind of atmosphere around any kind of star, and with this tool explore the range of planets we can have." His latest work concerning climates on terrestrial exoplanets, carried out with his colleague Jeremy Leconte, is a synthesis of this experience, along with a survey of the research literature. The paper, called "Possible climates on terrestrial exoplanets", is available right now on the pre-publishing site Arxiv, and in press with the Proceedings of the Royal Society. The "punchline" of the research, as Forget put it, is what factors control the composition of a planet's atmosphere. Studying all sorts of planets will help scientists learn more about life and habitability in distant worlds. What is the climate on a planet – and in particular how life-friendly it is- depends on three factors: the atmospheric composition (including the presence or absence of an ocean), its parent star's variability, type and distance away from the planet, and the type of planetary rotation. This can lead to life in unexpected places. Perhaps a star is smaller and weaker than our own sun, but the planet is at a shorter distance than the Earth is to its sun. Since that star's rays have a shorter distance to travel to the planet's surface, they could warm it to a similar extent as the sun does on the Earth. Or maybe a planet is roasting right next to a star, tidally locked so that the perpetual day-facing side is too hot to support life. On the night side, however, the atmosphere surrounding the planet could permit pockets of liquid water. View of the possible inner planets of the Gliese 581 system along with their star, a red dwarf. "This is very highly speculative brainstorming on what kind of cocktail of atmosphere we can have on a terrestrial planet," Forget said. "We don’t know quantitatively where we should put the boundaries between the various types of atmospheres. Also, keep in mind the physical processes that actually control the composition of the atmosphere are extremely difficult to model and simulate and calculate." The research, however, shows that different kinds of planets tend to have specific sorts of atmospheres. A gas giant, for example, is so huge that its gravity can hold on to the light elements of hydrogen and helium, which were likely the original elements in the solar system when the sun and planets were just coming together from a gas cloud. Earth likely had these elements in abundance in its atmosphere at the beginning, but lost them over time as the planet's mass is much smaller. A recent Nature Geoscience paper also showed that Mars likely had hydrogen in its atmosphere when it was young. "The star light heats up the water, putting more water vapor in the atmosphere, which enhances the greenhouse effect and amplifies the heating," Forget said. Planets farther away from a star similar to our sun (say, at Jupiter's distance) would see the carbon dioxide freeze out and collapse on to the surface, although nitrogen can still remain until planets are beyond the equivalent distance of Neptune in our own solar system. As Forget's team refines the model it is also applying the research to current exoplanet discoveries. One notable set was several planet candidates found in recent years around Gliese 581, which is about 20 light-years away. Astronomers initially felt that Gliese 581c was potentially habitable, but changed their minds after follow-up research, Forget explained. 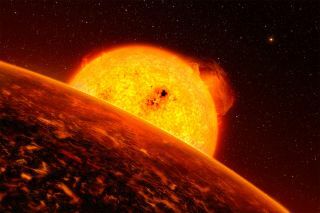 "Initially, the astronomers were very excited about 581c, but very quickly they interacted with climatologists like me who said it cannot be habitable. It is way too close to the star and there will be a runaway greenhouse effect," he said. "With another member of the team, Robin Wordsworth, we applied our model to the planet and found it was quite easy to show that, with a reasonably thick atmosphere, it still has warm enough temperatures for liquid water, so it's not impossible that it was habitable," he said. The atmosphere of exoplanet HD 189733b streams away at speeds of 300,000 mph, according to observations from NASA's Hubble Space Telescope. As for Gliese 581c – the planet that initially excited astronomers – Forget and Leconte are not altogether ruling out habitability. There could be different climate regions on the planet, with a spot at the edge of the night side still cool enough for liquid water. Two motivations drive Forget's team to learn more. The first one is to prepare for observations for a time when telescopes can pick out more about small exoplanet atmospheres, whatever they are: hot, temperate, or very cold. Also, they hope to "make progress on these never-ending questions on habitability, are we alone in the universe, and so on," he said. "We have no observations at all about atmospheres on terrestrial planets, yet we know there are a lot of terrestrial planets everywhere; a very high fraction of stars have these planets," he added. And when those results come in, Forget's team hopes to be ready to learn more about if life could exist in those places, and how.